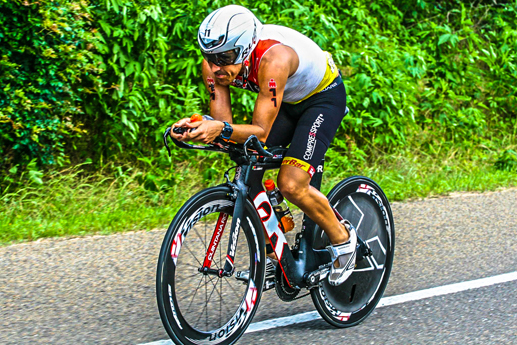 When it comes to achieving your perfect triathlon bike fit, keep things in context; in other words, you have a swim and run with the bike in the middle. 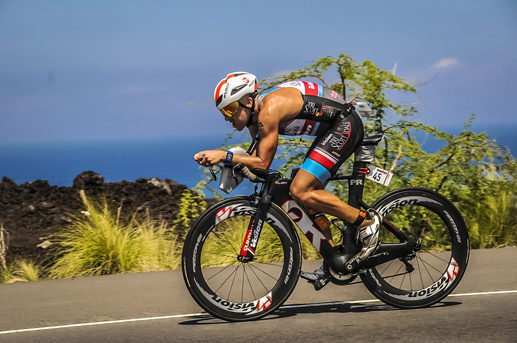 Your triathlon bike fit isn’t purely about making you as fast as possible on the bike – it’s about making you efficient on the bike, while allowing your body to function to its optimum on the run. If you go too aero, muscular tension will hold back the run. Thankfully, achieving a good fit is easier than a lot of people imagine. Don’t buy the size of bike you think you need and then struggle to make yourself fit it. Work out your correct fit – either in the shop or on an existing bike – and then buy the bike that allows you to achieve that fit most easily. Sit on your bike with your weight central on the saddle and arms on the bars in your race position. Position one leg at the bottom of the pedal stroke and straighten your knee. If your saddle is the right height, the sole of your shoe should tilt downwards with the heel 1-3cm lower than the toe. Repeat this on the other side and set the saddle height that’s the best compromise between the two. Check your saddle height by getting someone to take a side-on picture of you on your bike with one leg in the 6 o’clock position. The angle in your knee (between your upper leg and lower leg) should be 25-35°. There are various ways to alter the height of your aerobars and, in turn, the angle of your upper body. You can flip your stem over or swap to a new one, remove headset spacers or, sometimes (depending on the model), adjust the height of spacers between your base bar and the armrests/aero extensions. A flat torso is aerodynamically efficient but it’s not realistic for most triathletes, so it becomes a question of how far to incline your upper body skywards. One technique is to lie flat on the floor with your legs out straight and then ask a friend to help you bring one hip into flexion – so your bent knee comes towards your chest. They’re looking for the point where you feel movement slightly impaired. 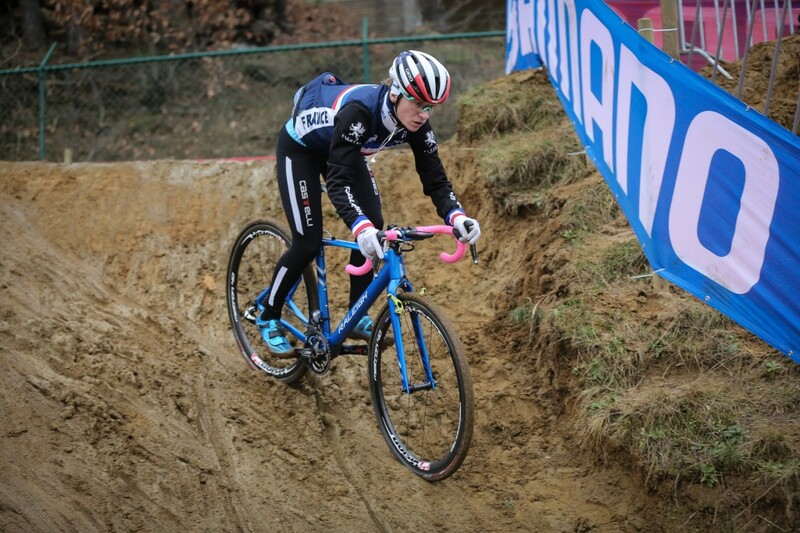 Ensure the angle between femur and torso on the bike is no more acute than this. You can tweak the distance between your saddle and aerobars by changing the stem or moving the saddle forward on its rails. You can also swap seatposts or, on some designs, alter the position of the clamp on top of the seatpost. Around 90° between your torso and your upper arm, and at the bend in your elbow is the ideal. Position aerobar extensions so that your forearms sit parallel to the ground. You want the fleshy part of your forearm on the armrest and the shifter within easy reach of your thumb and forefinger. Setting your aerobar extensions close together makes sense aerodynamically, but if you’re a large rider and you squeeze your chest in order to get your arms on the armrests, you can constrict your lungs. Go narrow but ensure it’s sustainable. To improve streamlining, you want your head and helmet to sit low so that they don’t increase the size of your frontal area, but that’s difficult to achieve if your torso is pointing slightly upwards. You might need to adjust your head position although that’s hard to sustain for a longer bike leg if it doesn’t come naturally. Again, it’s a matter of compromise between aero efficiency and comfort.